It was early morning and still quite dark outside. I was watching the news over a second cup of coffee when suddenly, the room went pink. 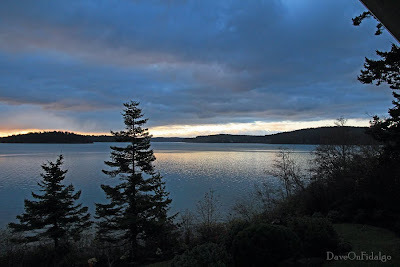 I grabbed the camera and caught this Skagit Bay sunrise just in the nick of time. A moment later, it was gone. 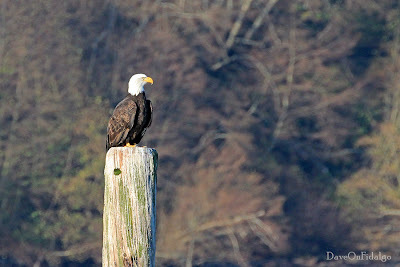 Meet the Bald Eagles of Ala Spit at Wild Fidalgo. 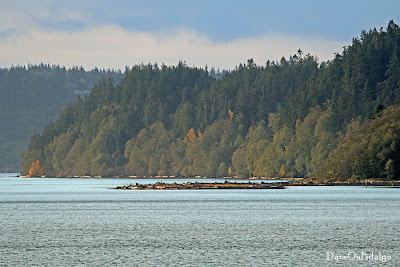 I have discovered that this Whidbey Island county park is a great spot for viewing wildlife. 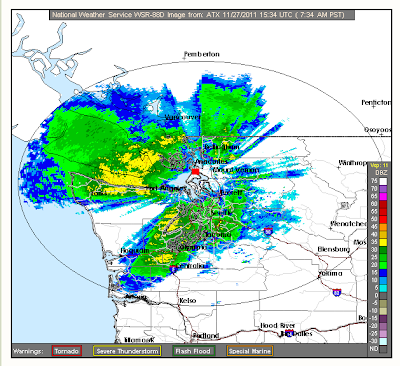 We speak occasionally here about the Olympic Rain Shadow. It is also known as the San Juan Sunbelt, Banana Belt and the Blue Hole. This is what accounts for a surprisingly low annual rainfall in the area of the western Strait of Juan de Fuca, northern Puget Sound and the southern Strait of Georgia. You can see the rain shadow on the radar map from this morning. It is literally the hole in the middle of the rain image. 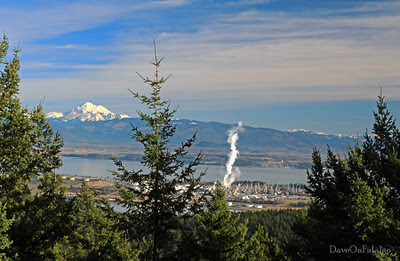 The Olympic Mountain Range sits southwest of the city of Port Angeles. The clear wedge in the radar image locates the mountains which the radar cannot penetrate. November is our rainiest month, and late November usually means a succession of windstorms rolling through. 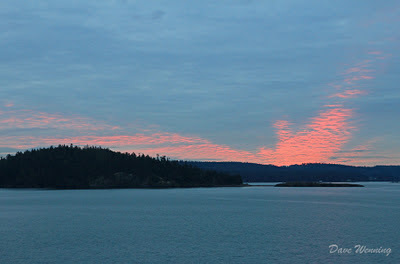 At Wild Fidalgo, we discover a lesson in diversity and tolerance at Deception Pass State Park. 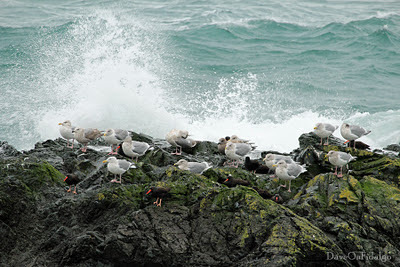 Under an approaching windstorm, Black Oystercatchers and Glaucous-winged Gulls take a rest on the Thanksgiving holiday. Have a great Thanksgiving, everyone. This is a zoomed photo of Ala Spit as seen from my house. For many years I gazed at it through binoculars and I wondered what it was. To the naked eye, it looked artificial. That is Whidbey Island over there and it turns out, the spit is an Island County park. It is also a natural sand spit built by currents, tidal action and wind. I have now made two visits to the park. Ala Spit is a deceptively complicated land form system packed into a narrow strip of sand. A salt marsh and pocket estuary are sheltered on the leeward side. Other features include rocky beach, mudflats, a coastal grassland and driftwood field. 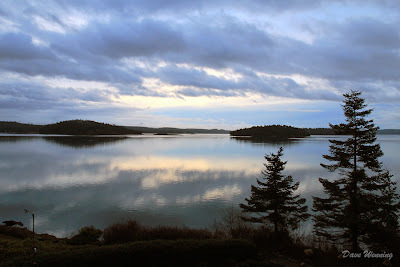 It is a popular spot for fishing, clamming, wildlife viewing, browsing and beachcombing. Beyond the spit to the east is Skagit Island (left) and Kiket Island on the right. Skagit is a state park offering boat moorage, camping and diving. It is accessible only by boat. We have visited Kiket and its little companion Flagstaff Island before. 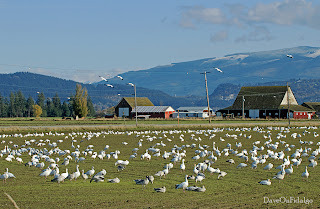 At Wild Fidalgo, check out the Snow Geese of Fir Island, Washington. I have discovered a fascination with macro photography. This is when you take pictures of small things up close. Instead of photographing a tree, a macro shot might focus on one of its leaves. While fall is a season of decline, it does not express itself with a lessening of intensity. 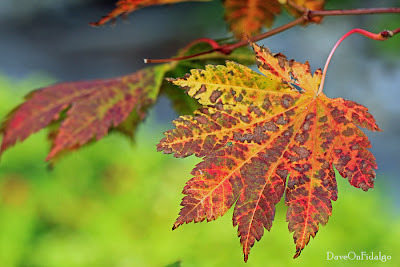 Above is one of our Pacific Northwest natives, the Vine Maple (Acer circinatum). Enjoy this album of some of the autumn colors in my garden. For shade-loving Hostas, this time of year means "Hosta la vista." 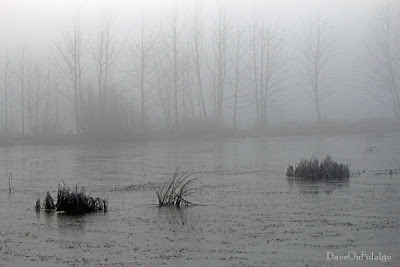 They die back and disappear completely. We won't see them again until around April.